If you have internet access, you can watch an overview video of Adapt It. You can also download it to watch later by clicking on this link (40 MB). If you have internet access, you can connect to our online help system at this link. 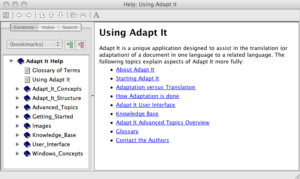 Adapt It Tutorial.doc – tutorial for Adapt It (this tutorial can also be found online by heading over to our Getting Started link). Adapt It Reference.doc Reference materials for Adapt It. These documents can be found in the same directory as Adapt It.